100 Words, 100 Days: Day 45. On Change. | What I think About When I Think About Writing. ← 100 Words, 100 Days: Day 44. On Luck. 100 Words, 100 Days: Day 45. On Change. Most of us have a pocket or purse full of loose change, yet we’ll pay for something small, like a bottle of Coke, with a twenty or larger. In this respect, we like change. We like how it rattles and chings in our pocket. Most of us call for change, whether it’s of government policies or government itself. We demand change in our living circumstances. But when change affects us directly, we don’t like it. 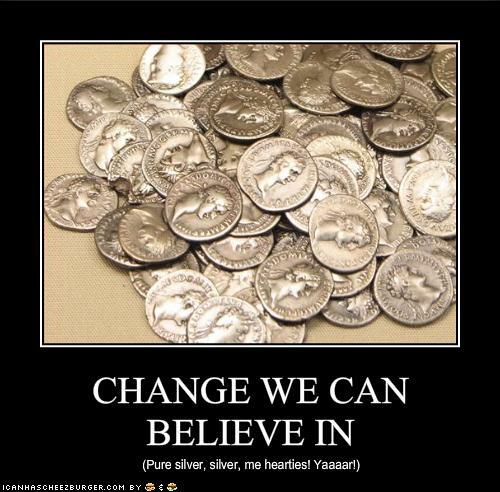 We are averse to having less change that rattles and chings in our pockets and purses. How does change affect your life? Or does it? This entry was posted in 100 Days, 100 Words, Life, Money, Philosophy and tagged 100 Days, Business, Change, Government, Government policies, Money, writing. Bookmark the permalink. Both in the weight category and in the sense of our surroundings. It seems like the more change we have the more bills we get…but not in a good way. It’s tough. I don’t generally invite it or plan it because my routine (or my ruts) are comfy and safe and to some degree help me deal with the unexpected twists and turns. I’m a very ‘go with the flow’ guy, and I adjust well, but now and again I get tired of my ruts and need something new, a jolt out of the blue. I’m feeling that way now. I need some change. I always try to pay with the exact change, I hate having a purse full of coins and not knowing how much money I’m carrying. I think people like to have change because they have more money, even if it doesn’t make them any richer. I work for a furniture company in the 18 years. Since I work there I only had 2 positions, but I have had 9 bosses, 2 presidents and moved 19 times. I always say if you hate something, don’t worry, it won’t last long, we’ll be changing again soon:) That’s whats good about change….nothing last to long when its around.